Officer Crowther was shot to death by a transient. When he failed to return home from patrol the previous night, a search was begun. At 10:00 a.m., the body of the 45-year-old victim was found on a bank of the Jordan River, three blocks from his home. He had been shot once in the head with a .32-caliber pistol. His vehicle, handgun and watch were missing. On Oct. 16, three men driving Officer Crowther’s bloodstained vehicle were arrested in Ludlow, California. The men were extradited to Utah, charged, tried, and found guilty of robbery and murder. Two of the men were eventually paroled. The suspect who shot Officer Crowther was executed at Utah State Prison in 1926. Officer Crowther was married and the father of three children. He is buried in Salt Lake City Cemetery. His nephew, Leonard C. Crowther, would rise through the ranks to become police chief. 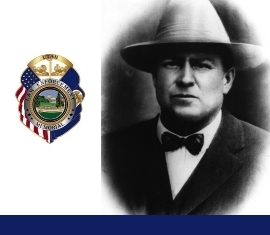 Officer Crowther’s bronze name plaque is sponsored by the Salt Lake City Honorary Colonels.